Focus on Cities or Farms? 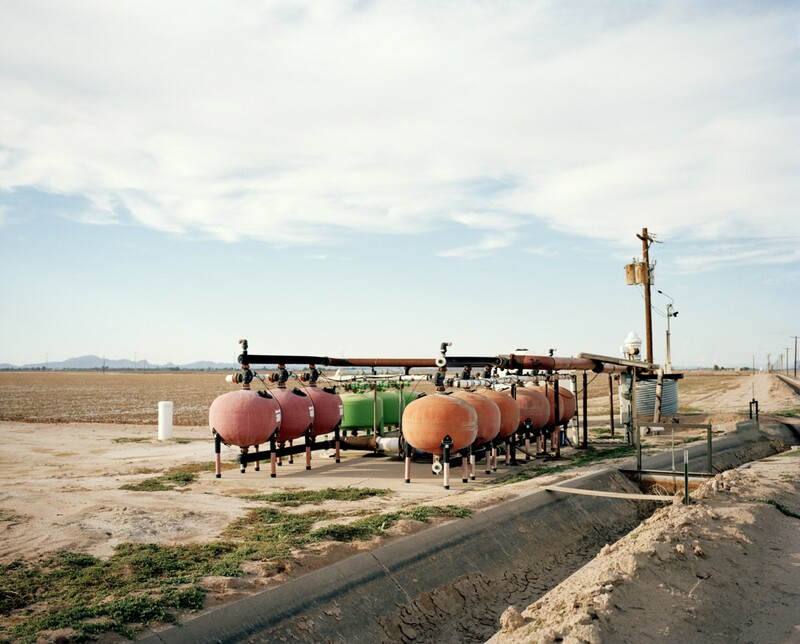 This week, ProPublica and Matter begin publishing Killing the Colorado, a multi-part series by Abrahm Lustgarten investigating the truth behind the water crisis in the West. In his report, Lustgarten explains how man-made policies and practices have helped drive today’s crisis. Water Talk gathers some of the smartest thinkers on water management issues to discuss the causes, perils and potential solutions surrounding the current crisis. It will be a virtual water crisis conference, featuring expert voices from different perspectives, including farming, the environment, water law, science and policy. Farmers now use a lot of the West’s water resources. Some say up to 80 percent of the available water coming out of the Colorado River. 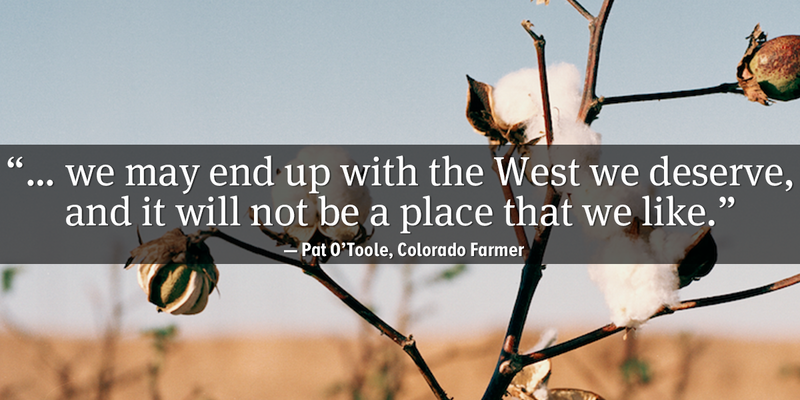 Pat O’Toole, a farmer from Colorado, says that’s not entirely true. Robert Glennon, a water expert from the University of Arizona says it is. What isn’t debatable is that many of the crops grown in the West are among the thirstiest in the world. So does irrigation of these crops make sense in a drought-stricken, water-scarce region? Are the crops farmers chose to grow a priority for the public? Should the burden fall on farmers to reduce their water use or on cities to change their habits as the world ticks closer to nine billion people (all of whom need to be fed)? Colorado farmer Pat O’Toole and water expert Robert Glennon of the University of Arizona discuss where water cuts should come from, the future of farming, and the consequences of not opening our eyes to the unfolding water crisis. I think that Western farmers can have a bright future, though they will need to use less water than at present. But if the cities expect farmers to cut back, the cities need to get their own houses in order. Let’s start with water conservation, which remains the low hanging fruit. Residents of Southern California and Central Valley cities continue to use immense quantities of water to grow emerald green lawns and lush gardens, and to fill private swimming pools. Sometimes I wonder: don’t they understand that they live in deserts? Let’s face it: we Americans are spoiled. When we wake up in the morning and turn on our taps, out comes as much water as we want for less than we pay for cable television or cell phone service. With no financial incentive to save, many citizens don’t do so. I think that government has a stewardship obligation to encourage all citizens to use water wisely. Have something to say to Robert or Pat? Leave a response at the bottom of this post. If we do not use this question as a starting point, we may end up with the West we deserve, and it will not be a place that we like. We must reach a consensus on how to distribute water to those who need it. Water is required for growth in urban areas, for food production, for energy production and for environmental needs. Conservation has been called “low-hanging” fruit, and it may be, but it is part of the answer, not a panacea. Everything from xeriscape lawns to reuse of treated water needs to be maximized. This takes money, but offers solutions. Farmers are being told to double the food supply in the next 30 years or so, in order to feed a world population estimated to grow to more than 9 billion mouths. This is a worldwide challenge, but the U.S. has a large proportion of the world’s most arable land and most productive climates. There is no inherent contradiction between good production and sustainability, but we have to be smart enough to do it. Farmer bashing has become popular, with groups saying that agriculture uses some 80 percent of water. The truth is, according to the California Department of Water Resources, water use in that state breaks down as follows: 10 percent urban use; 41 percent agricultural use and 49 percent use for environmental management: wetlands, Delta outflow, wild and scenic designations and instream flow requirements. Consensus building is the only solution. It is possible within the existing framework of laws and relationships. It is the only path to the West we want. Where we don’t agree is on the percentage of water consumed in agriculture whether it’s 50 percent, as you think, or 80 percent, as I think, a small single digit decrease in agricultural consumption translates into a large percentage increase of water available for consumption by cities. Yes, some solutions to our water shortages are going to be very costly. I’m thinking of modernization of farm infrastructure, such as by the installation of drip or micro-irrigation systems. These systems are extremely efficient, but may cost thousands of dollars per acre — a sum way beyond the means of many farmers. But what if municipal and industrial users financed irrigation modernization in exchange for getting some of the water conserved? Farmers would grow as much product as before, but with less water. And cities would get to use water saved by the expensive systems they paid for. The cities, in turn, would recoup their investment by passing the costs on to developers and others in need of water. To developers, it would be a cost of doing business. It’s not a ban on growth; it’s a demand-offset system, which requires growth to pay its own way. This partnership would benefit farmers because not only do drip and micro-irrigation systems save water, they also improve uniformity of many crops, which increases the price for farmers’ product. The myth of efficiency is so prevalent that it seems to be a no-brainer. The truth is that efficiency is appropriate in some places, and not in others. In the Upper Basin, the change from flood irrigation to sprinklers has dried up rivers and wetlands. In many places, flood irrigation provides the recharge to aquifers and wildlife habitats for many species. Farmers and ranchers are vulnerable to Endangered Species Act regulations. Finding the right balance is critical. The concepts you mention are being implemented in some places as we speak. In California’s Central Valley, farmers have spent $3 billion, and transferred 2.5 million acres of farmland to ultra efficient drip between 2003 and 2013. We must keep in mind that all solutions are local. As for developers, my sense is that they will only be happy when we have unsustainable cities, and not enough farmers and farmland. Over 50 acres of U.S. farm and ranch land are lost every hour, according to the American Farmland Trust (AFT). Fifty-seven percent of farmers are 55 or older (AFT). Young people are discouraged by the lack of access to affordable land, water and credit. The reality of needing to increase the food supply is undeniable, yet we continue to demonize and discourage farmers. Water is crucial to food production. The statistics regarding the need to feed a growing population are clear. The Family Farm Alliance seeks solutions to provide for urban needs, but not to encourage developers. I haven’t seen the developers’ vision for the future. Robbing Peter to pay Paul is not a solution but a mirage. I agree with you that opportunities to save water through efficiency improvements depend on the location. Still, in some places, such as Central Arizona, flood irrigation loses vast quantities to infiltration that does not replenish the aquifer. Across the West, flood irrigation is used on almost half of all farmland. Every acre of this land loses water to the sky through evaporation. This loss can be very substantial, especially in desert regions. It makes sense to eliminate this loss by shifting to high-efficiency drip or micro-irrigation systems. Just as every farm has unique characteristics, so does every watershed, and every community. While we have to capability to perceive problems, and propose solutions, none of these exist in a vacuum, but as part of a whole system. Each region presents its own challenges. In the Central Valley of California, double drip irrigation is widely used, but is not suitable for every crop. 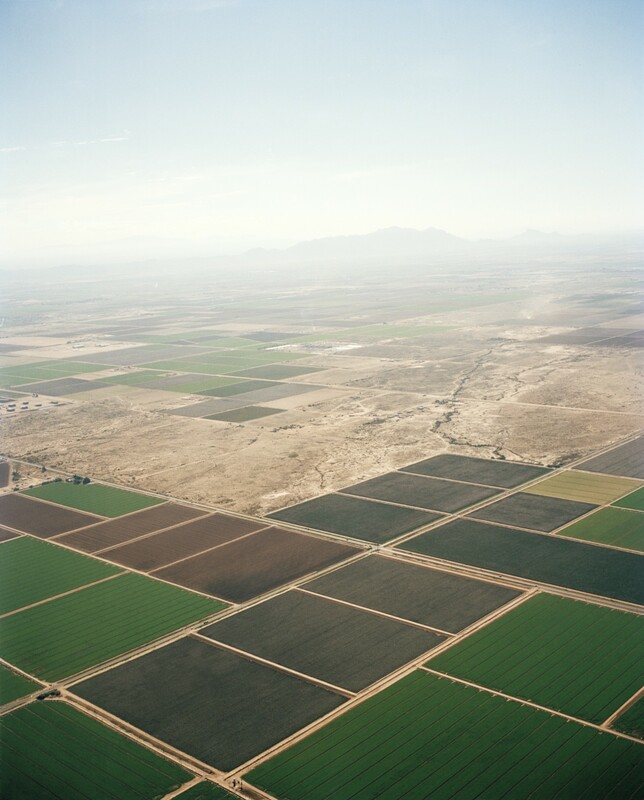 In Arizona, the irrigation districts in the Central Arizona Project system are some the most efficient in the West. This is due to mandatory conservation requirements from Arizona Department of Water Resources, and significant investments in efficient systems, at $3,700/acre. In the Upper Colorado Basin, flood irrigation also provides water for wildlife species, especially providing habitat for migratory birds. It provides recharge to the aquifers, which releases the water slowly and keeps springs alive. On the Front Range of Colorado, many farms have dried up as agricultural land and water have been used to support expansion of municipal and industrial interests, yet no provision is made to retain topsoil, the critical and under discussed skin of the earth. The amount of water taken from farms, or used in food production varies by region. I serve on the Advisory Committee of AGree, an eight-year effort funded by Foundations to try to figure out how to feed more than nine billion people expected to be on earth in the next thirty years. The necessary food must be grown in an environmentally sustainable manner, and provide good nutrition for people and good quality of life for farmers and farm workers. The use of any water “saved” through conservation for should augment additional crop production. This is at least as important as meeting the needs of other sectors like urban development, energy production, and instream environmental and recreational purposes. No doubt farmers have undertaken impressive conservation efforts. Unfortunately, water law creates disincentives for farmers to conserve. Consider, for example, the use-it-or-lose-it rule. If a farmer uses less water, she may actually lose the right to it! What an absurd rule. Sensible water policy should reward rather than punish farmers who use less water. Farmers should have the right to lease or sell some of their water to other farmers, cities, and industry. I agree that farmers who spend money to modernize their infrastructure should be able to use the water saved – even if it means that the farmer actually consumes more water by being more efficient. But, as you note, this is costly stuff. That’s why I like the idea of cities paying the upfront costs in exchange for some of the water freed up. It provides a way to avoid the buy-up-and-dry-up problem. What I envision is that farmers grow as much product as before, but with less water. And the water farmers no longer use would be available for the interests who subsidized the irrigation modernization. I’m also concerned about what happens to the larger farm community, such as the fertilizer and pesticide suppliers, farm implement dealers, and even local governments, which suffer if a farmer sells out and the land goes fallow. We must, for moral, political, economic, and security reasons, safeguard the future of our rural communities. Pat, I have so enjoyed this candid exchange with you. I am confident that people of good will can find the solutions to the water crisis. What we need is the moral courage and the political will to act. Robert — Thank you for your thoughtful observations. I appreciate the opportunity to exchange ideas and information with someone who is knowledgeable and insightful. I look forward to a continuing discussion on the complex and ever-changing issues in the world of water.